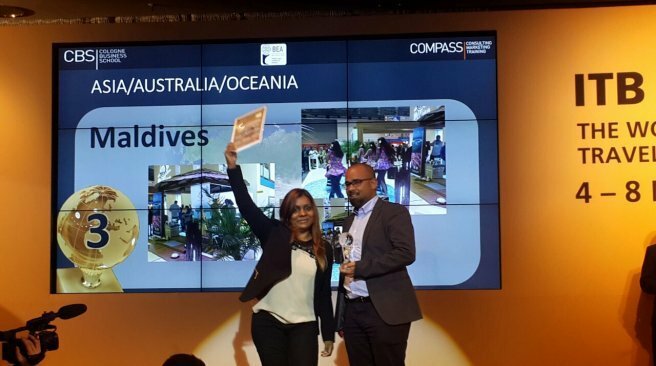 The Maldives’ stall at this year’s ITB Berlin travel trade fair ongoing from 9th to 13th March, wins third place. South Korea took the first place while the second place went to India. Oceania and Australia were amongst other Asian countries who competed. The Maldives’ stall exhibited 75 businesses and series of cultural dances while traditional dishes were served. An official of Maldives Marketing and Public Relations Corporation (MMPRC) commented to the local newspaper Haveeru that the spa services offered at the Maldives stall was admired and appreciated by a lot of visitors to the fair. Germans are the second largest nationality to visit the Maldives. Last year close to 100,000 visitors came to the Maldives from Germany. Maldives is the official partner of the 2016 ITB Berlin fair.